Scientists at NDSU have developed a graft co-polymer that confers amphiphilic properties to many materials, including polyurethanes, cosmetics, and surfactants. In the case of polyurethanes, this technology enables inclusion of resistance to biofouling and biofilm formation to be incorporated into the polyurethane structure. The graft co-polymer comprises 1) a polydimethylsiloxane backbone, 2) an attached hydrophilic polymer such as polyethylene glycol (PEG), and 3) one of variety of reactive functional end groups. 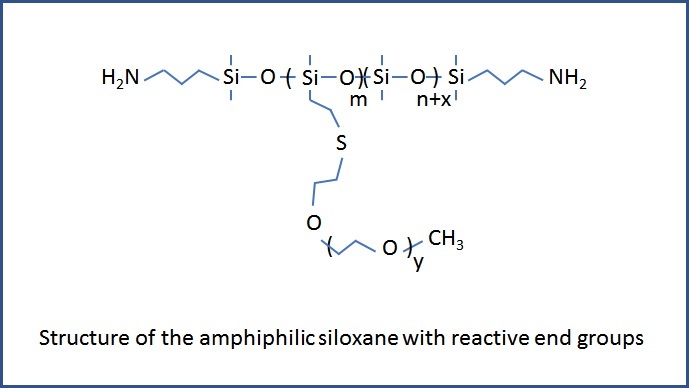 These reactive end groups enable incorporation of this graft co-polymer into polyurethane and other materials, which adds hydrophilic molecules into an otherwise hydrophobic material. The resulting amphiphilic materials resist both attachment and retention of biofouling organisms in polyurethanes, and also enable incorporation of amphiphilic properties into cosmetics and surfactants. The technology involves the synthesis of a novel graft co-polymer of PDMS having pendant PEO chains, but also retaining terminal reactive groups. This functional graft co-polymer is then incorporated into a polyurethane coating composition whereupon, due to self-stratification, the applied coating has an amphiphilic surface that can resist biofouling. This technology is the subject of issued US patent 9,169,359, and is available for licensing/partnering opportunities.